Installing a play set or jungle gym, gives the gift of play to a child. However, a bumpy patch of ground may lead to an injury if not properly leveled, or a support pole may be vulnerable to collapse without solid ground underneath. Using solid ground is best for securing large pieces, whereas sand can be used to level the ground around the play set. Soft sand will cushion a fall and provide another outlet for imaginative play. Use a string level to measure your playing area. Hammer two stakes at either side of your playing space. Tie a string between them. Leave a little slack in the string. Tie a level to the center of the string. Adjust your string on one side until the level in the center is straight. Measure the distance between the string and the ground along the whole length of the string. Record your measurements to determine the amount of filler dirt you will need for ground leveling. Repeat this step as needed over the entire playing space. Use the dirt from the higher sections of ground to level out the lower portions of ground. This is best executed if the difference in ground height is more than 2 inches. Avoid shoveling too deep; stay close to the surface of the ground. Lay the earth on the low sections of ground evenly. Smooth out the earth using the flat side of your shovel and a rake. Build a two-by-four level that is slightly longer than your playing space. 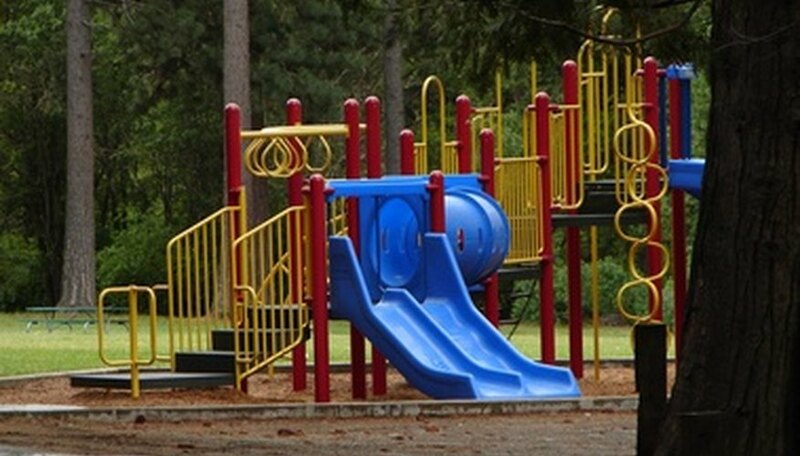 Your playing space will have to cover a larger area than the actual size of the jungle gym to create a buffer for falls and running; 6 feet on all sides of the play set is recommended. For instance, if your playing space is 20 feet wide, then your two-by-four will have to be at least 32 feet long. Connect multiple two-by-fours using a hammer and nails. Pour your sand onto the lower end of the ground first. Spread the sand around your playing area using a shovel. Place your two-by-four level on the sand. Spread the sand out under the two-by-four until it lies flat. Test your newly leveled ground by moving your level at different angles around the playing space. Pack the top of the sand tightly. Occasionally you will have to repack the sand around the playing space to keep the soft play area intact.